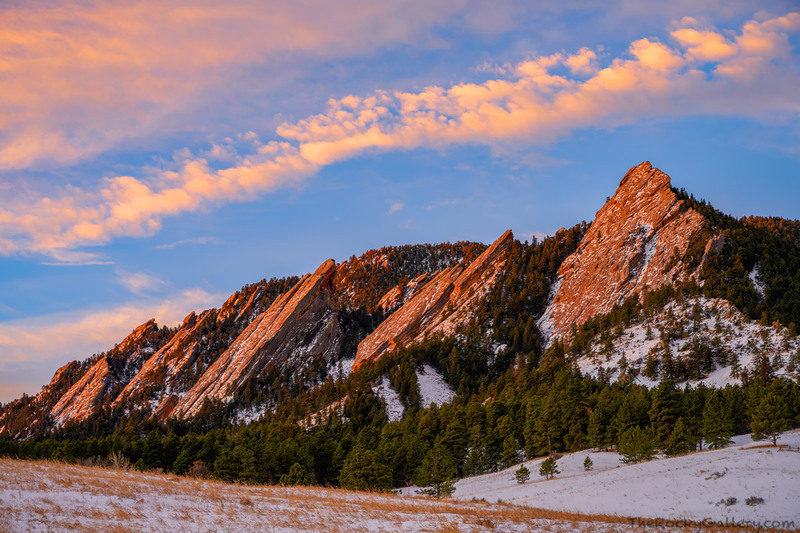 I’m going to post another image here of the Boulder Flatirons from Chautauqua Park that I shot yesterday (Sunday). Since the government shut down occurred I’ve been spending most of my time photographing around Boulder and have only made a few trips up to Rocky Mountain National Park. None of those visits to Rocky have produced any images worth posting and really were just ways for me to keep up to date on the conditions. To be honest, even with the park open and a skeleton crew of employees along with dedicated volunteers helping to maintain the park, visiting and posting images during the shut down left me with mixed feelings. As much as I love Rocky and depend on it to make up for about 80% of my photography portfolio, working and photographing in the park while others were in limbo did not seem very conducive to creating photographs or art. Luckily, the Rocky Mountain National Park is back open, at least for the time being and I am motivated and ready to get back out there and start photographing and exploring my favorite location not just in Colorado to photograph, but favorite subject period. With that said, I’m equally as blessed to be able to photograph some iconic locations really close to home that were not affected by the government shut down. Many of you who follow my photography know that when I’m not photographing Rocky Mountain National Park, I’m out somewhere around Boulder or Boulder County photographing it’s scenic wonders and beauty. Boulder and Boulder County could be a National Park onto themselves. In fact a good portion of Rocky Mountain National Park resides in Boulder County. One of the jewels of Boulder and Boulder County is Chautauqua Park and Chautauqua Meadow. Its from here that one can photograph the iconic view of the famous Flatiron formation. It’s difficult to think of too many better ways to start off a Sunday morning then right here in the meadow at sunrise. I found myself and a few other photographers doing exactly that yesterday enjoying the beautiful sunrise and January conditions. 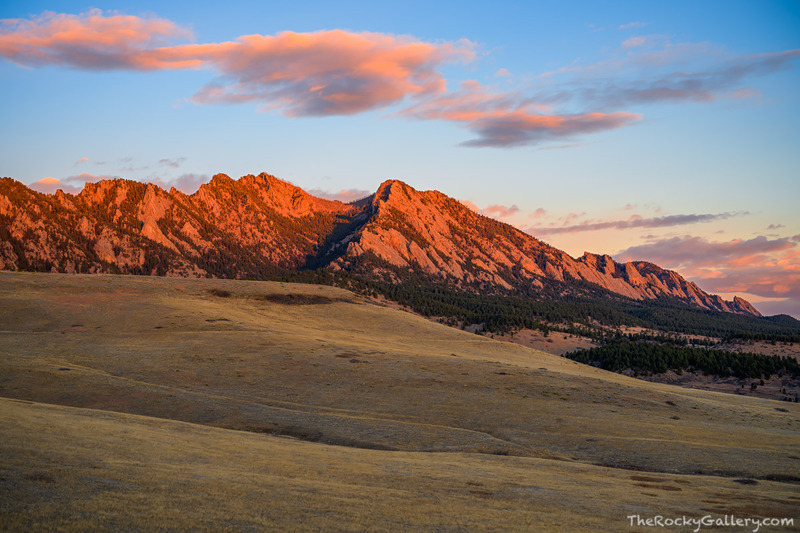 I’ll spend quite a few more mornings over the next few months in Chautauqua Meadow photographing the Flatirons, but I’m happy as heck that I also will get the chance to spend some quality time in Rocky Mountain National Park soon enough. Posted in Boulder Open Space, Colorado, Rocky Mountain National Park on January 28, 2019 by Tom Mangan. I apologize for the lack of blog posts lately. After wrapping up a very busy 2018 year of guiding and tours in Rocky Mountain National Park, I took a brief hiatus only to have the latest government shutdown make access to Rocky Mountain National Park difficult. As a reminder you can always check my Twitter or Facebook feeds that are linked at the bottom of this page as I post to them at least a few times a week if not more. While you can technically walk into Rocky as of right now, services are limited and getting into most areas of the park is fairly difficult. Furthermore, most of the better locations for winter photography would require quite a commitment to get to without the ability to drive to a trailhead. As of writing this it’s difficult to tell when the current government shut down may actually end as we have just past the 23rd day of the shutdown. I’m keeping my fingers crossed for all involved that a resolution can be found sooner than later and we can get back to Rocky Mountain National Park operating as is normal once again. While we wait out the shutdown, I’ve been keeping myself busy photographing in and around the Boulder area. Not only is this area my second favorite place to photograph after Rocky Mountain National Park, but I’m thankful I have a fallback that allows me the ability to get out and keep productive while the machinations of our current political climate grind away. I’ll again be offering photography tours in Rocky Mountain National Park for the 2019 season. If you are interested in heading out with me feel free to drop me an email and I’ll be more than happy to discuss dates, locations and times with you. Until we get some more clarity here, I’ll be out traversing the landscape and open space properties in and around Boulder and will try to make a few expeditions into Rocky because I miss getting out and exploring the park as much as you all do. Stay tuned for lots of posts and images as 2019 unfolds here. Posted in Boulder Open Space, Colorado, Photography, RMNP Photo Tours Info, Rocky Mountain National Park on January 14, 2019 by Tom Mangan.